It’s that time of year when everyone seems to be talking about their resolutions; the list of promises and goals they’re hoping to achieve in the year ahead. 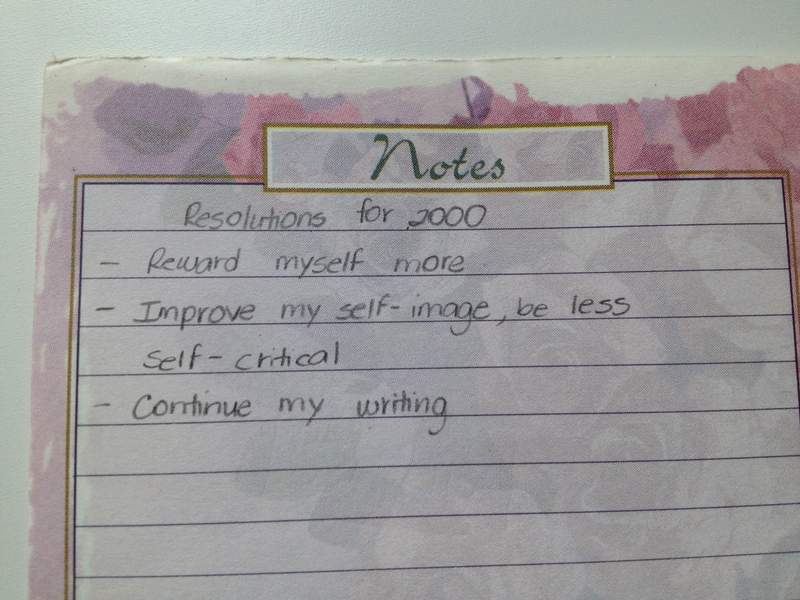 As I was going through some old papers recently, I came across a list of resolutions I had written for the year 2000. I had organized my list into two parts — “Resolutions for 2000” and “Things To Do in 2000.” Here’s what you should know about me back then: In 2000, I was 24 years old, had been married for one year, was working part time at the Beverly Hills Public Library, and was still an undergraduate at California State University Northridge. Here’s what you should know about me going into 2016: I’ll be turning 40. I’ll be celebrating my 17th wedding anniversary. I’ll be the mother of an eight-year-old son. I’ll be working towards furthering my freelance writing career. 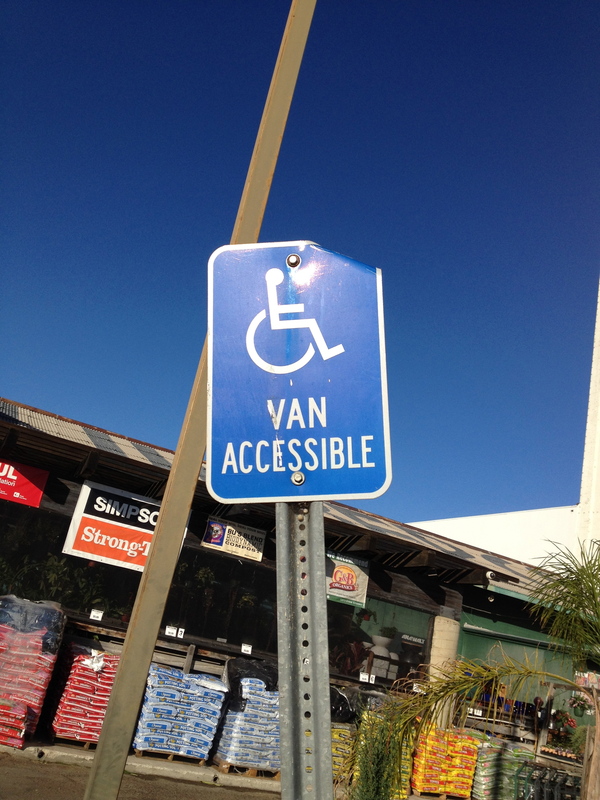 And, I’ll be doing all that while living with, and trying to manage, my autoimmune disease. Although my life circumstances have changed, the list of resolutions I wrote on the verge of 2000 seems just as relevant for 2016. Improve my self image, be less self-critical. When I first found this paper, I wondered what it said about me that, 16 years later, the same list of resolutions still applies to my life. And upon reflection, I think it just speaks of my consistency of character and values. My resolutions are more like life-long pursuits rather than short-term goals. As such, they are things I can’t ever really check off a list as “done.” Instead, they are goals and objectives that are always “in-progress,” in one way or another. Those are among my resolutions for 2016. I’d love to hear about yours in the comments section. And to all my readers, I send my sincerest wishes for a joyous and safe new year! Last year, when Ryan was six-and-a-half, he made his first request from Santa. 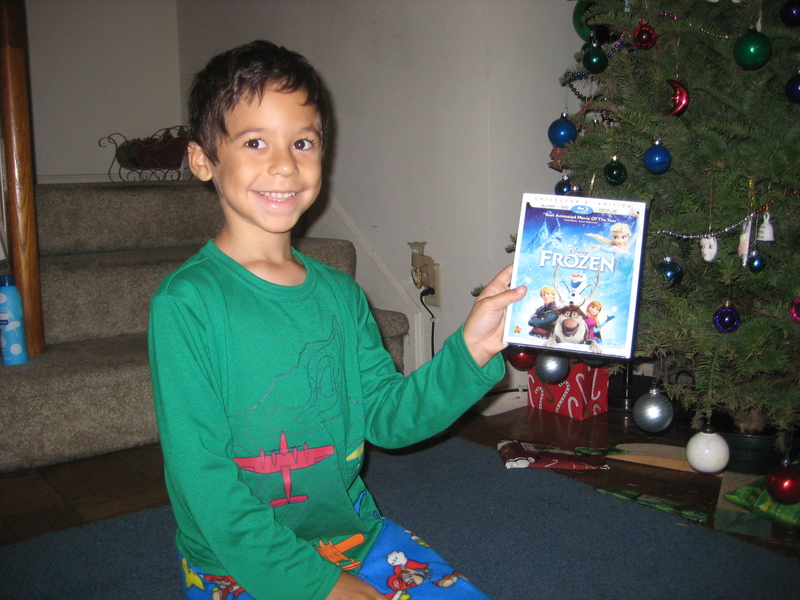 He wanted a DVD, and was ecstatic when he woke up to find that in exchange for a glass of milk and a plate of cookies and carrots, he was left a copy of Frozen. This year, Ryan has asked for three items (two basketball-related, one a book). And a spot on the nice list means he wakes up Christmas morning to find the special items he requested wrapped and waiting for him under the tree. I love the simplicity of Christmas for Ryan. The direct cause-and-effect relationship that makes so much sense. Because it seems like so much in life (my autoimmune disease, random acts of violence) make no sense and have no logic associated with them. But on Christmas morning, regardless of what is happening around the world or in my body, I will wake up knowing that my son is happy and healthy, and has been justly rewarded for another year of niceness. This holiday season I’m doing something I haven’t done since 2007. I’m sending out regular holiday cards. Since my son was born in 2008, our holiday cards have featured a photo. Not those generic ones that other families mail out; those super-glossy ones that leave no space for a personal hand-written message. Instead, I used to send out cards that had an insert for a 4×6 photo. Most years the picture featured my son. A few years it was a family photo. 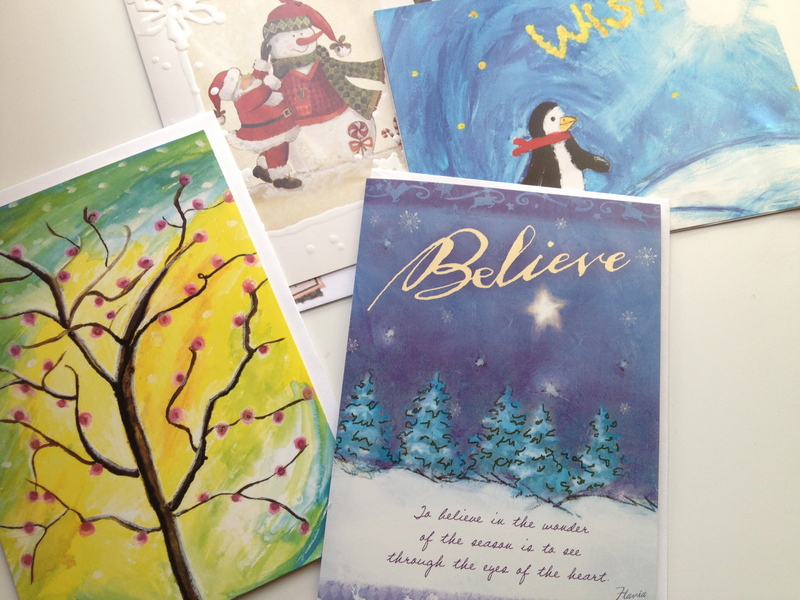 And inside each card, I wrote a specific message to each recipient. This year, though, is different. I’m mailing out regular holiday cards, for several reasons. First, I got to wondering what happened to the cards after the holidays. I know many of the ones we’ve received wind up in the trash. And the thought of my son’s picture in someone’s recycling bin made me really sad. Secondly, not using a photo means I save myself several steps (and some money). I don’t have to select a specific photo to be used in our cards. I don’t have to order the photos from Walgreens and then go pick them up. And, I don’t have to worry about fitting the photo inside the insert of the card. Third, the people closest to me already know what my son looks like. If they haven’t seen him in person, they’ve seen pictures of him (either when we meet, or through email). I’m still writing messages inside each card. I’m still decorating the envelopes with holiday stickers. And I’m still sending wishes for a happy holiday season. Because I’m a writer, I’m constantly taking down notes. Writing down things that I want to remember, things that I want to write about, things that resonated with me in some way. We were comparing and contrasting the holidays, talking about what they have in common and what makes each holiday unique. And Ryan surprised me with what he said. He asked me to spell Kwanzaa, and he counted out the letters on his fingers. 7. Then he asked me to spell Hanukkah, and he counted out the letters on his fingers. 8. And my seven-year-old son came to the conclusion that Kwanzaa lasts for seven nights because it has seven letters, and Hanukkah lasts for eight nights because it has eight letters. I loved the simplicity of that explanation. Especially because there’s so much about holidays and religion that I don’t understand at all. For instance, why does Christmas occur each year on December 25th, but Easter varies, and sometimes falls in March and other years during April? 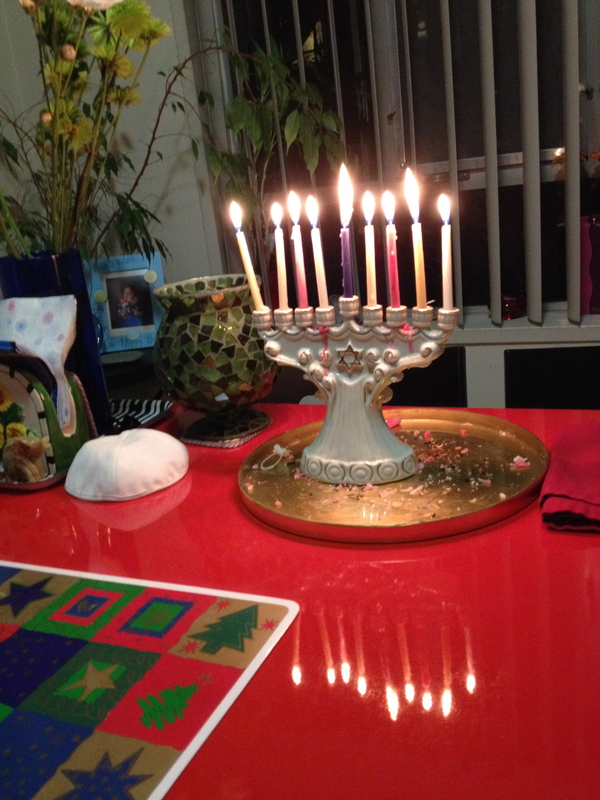 Why does the start of Hanukkah vary so widely? (Remember the year it started during Thanksgiving week? In our house, we were eating turkey and latkes). At any rate, as the days seem to get more frenzied, parking lots more crowded, and lines longer, try to keep in mind that it really is about the simple things — being with your family and loved ones and enjoying the moment.